A Christian Holiness Collection presentation. 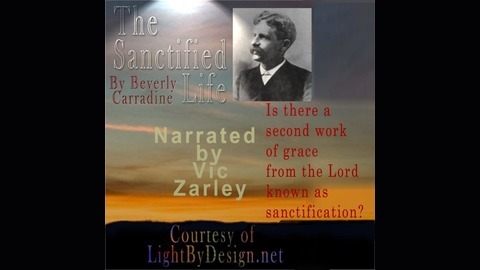 Reverend Carradine was a holiness preacher and writer who thrived during the holiness movement in America which took place from the late 19th century until the early 20th century. 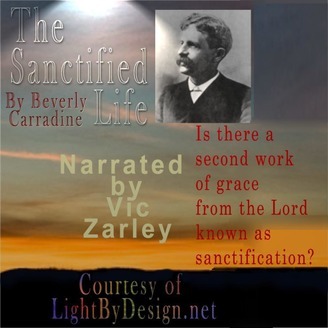 This book argues for the existence of a 2nd work of grace from the Lord known as Sanctification. Chapter 1: Theories in Regard to Sanctification Chapter 2: The True Theory Chapter 3: The Blessing Is Obtainable Now Chapter 4: The Blessing May Be Lost Chapter 5: The Blessing Can Be Recovered Chapter 6: How to Keep the Blessing Chapter 7: Some Features of the Sanctified Life Chapter 8: The Loneliness of the Life Chapter 9: Prayer and Reading Chapter 10: Witnessing Chapter 11: Good Works Chapter 12: Fasting, Tithes, and Dress Chapter 13: Moods, Affinities, and Impressions Chapter 14: Doubts, Fears and Fret Chapter 15: Come-Out-Ism and Put-Out-Ism Chapter 16: Secret Societies Chapter 17: Sidetracks—Sin, Imprudence, Habits, Erroneous Teaching, The Third Blessing Error Chapter 18: The Great Remedy Produced and narrated by Vic Zarley. Special thanks to LightByDesign.net, Northwest Nazarene University, and the Wesley Center online for their invaluable assistance in the production of these audiobooks. Thanks to deansouglass for his photo, "Beauty is the Sky Above" found at Flickr.com which I used for the coverart. Thanks to JewelBeat.com for the theme music entitled "Majestic."